This article first appeared in The Edge Financial Daily, on January 24, 2019. If you hope to see traditional four-door sedans on display at the North American International Auto Show in Detroit, which opened to the public on Jan 19 (and runs till Jan 27), prepare to be disappointed. Where sedans used to dominate, now trucks and sport utility vehicles (SUVs) roar, with the occasional legacy sports coupe thrown into the mix. The shift coincides with reports of factory closures and shift reductions and with a general expectation from analysts and car executives alike that American carmakers may have hit peak sales in 2018. 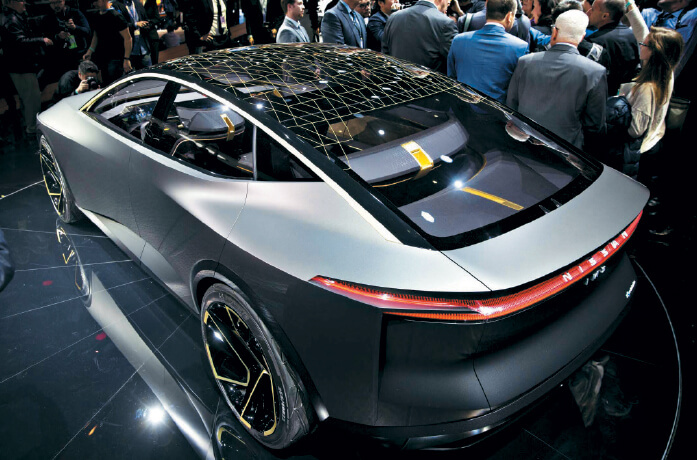 As Stephanie Brinley, the principal analyst for IHS Markit research, puts it, customers have shifted their attention to utility vehicles, and that means automakers are rethinking how — and whether —they use trade shows in the first place. That said, there were several quality stars at the show this year. They included big SUVs from Kia and Cadillac, a powerhouse truck from Ram, and an electric crossover from Infiniti. Two halo projects —the Ford Shelby GT500 and the Toyota Supra — added glitz, though not enough to give the 30-year-old show any real glamour. The Ford Shelby GT500 is the most powerful vehicle Ford has ever made. This highly tuned Mustang comes with a supercharged, 5.2-litre V8 engine and more than 700 horsepower (hp). The new, seven-speed, dual-clutch gearbox gives it split-second shifting power for zero-60mph (96.6kph) sprint times of just over three seconds. 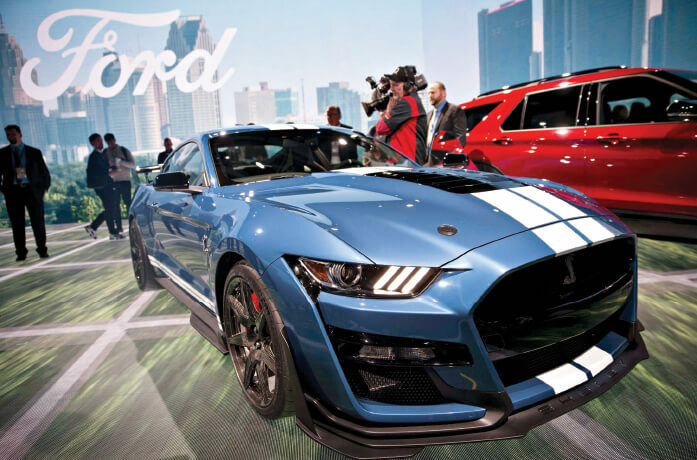 The new Shelby also boasts a redesigned grille, a large black vent in the hood, glossy, black 20-inch (50.8cm) wheels, and paint options such as “Twister Orange Metallic”, “Red Hot Metallic” and “Grabber Lime”. An optional aero kit adds an adjustable carbon-fibre spoiler and a new front air dam to make the car look even meaner. 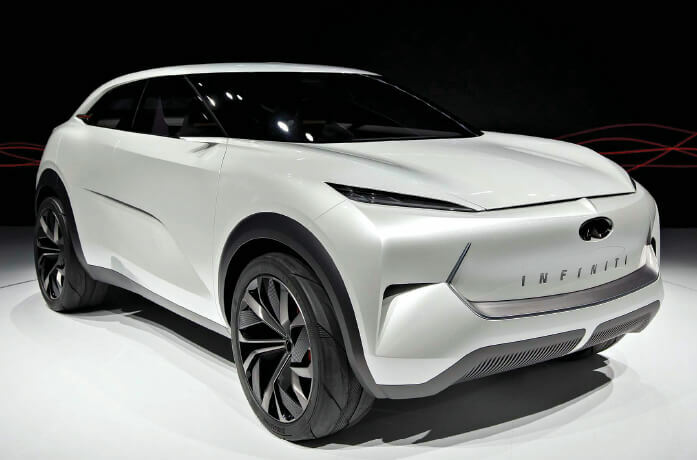 The Infiniti QX Inspiration concept is the first-ever all-electric vehicle from the Nissan-owned brand. Built around principles of traditional Japanese design, it is meant to look like folded origami paper in the front and have a warmly hospitable, lounge-like feel inside. The steering wheel and foot pedals retract to allow for automatic driving. 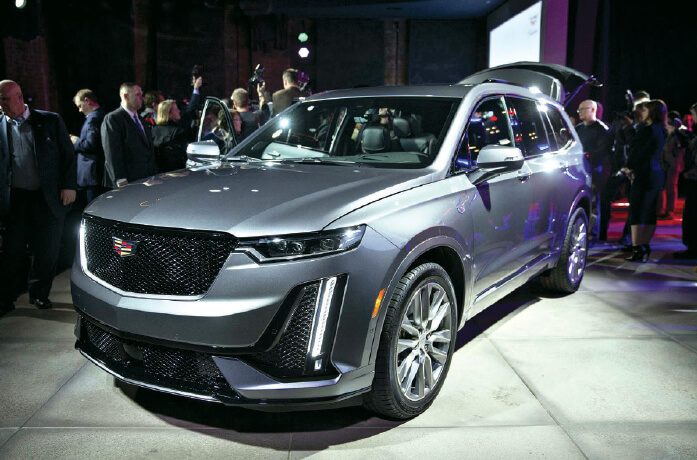 But the QX also took the brunt of an embarrassing moment at the show: The SUV concept failed to pull forward on cue during its official public debut on Monday afternoon. It remained backstage as designers pressed ahead with their scripted presentation. 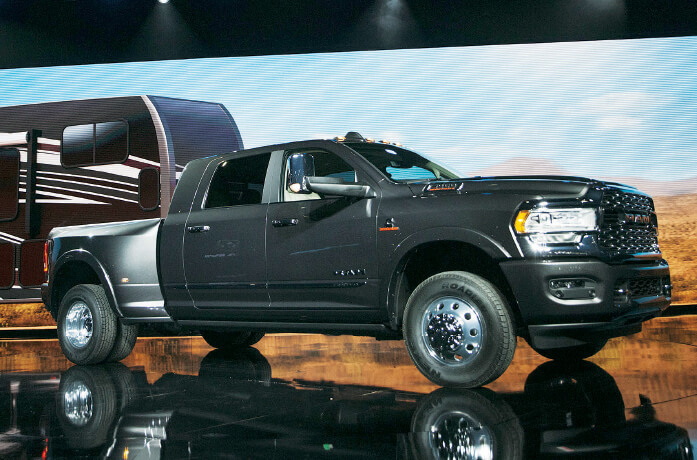 Ram’s biggest variant comes with up to 410hp on a V8 Hemi engine; it can tow more than 35,000 pounds (15,909kg). Inside, there is full leather trim, and outside, six different styles available for the front grille. Cruise control and emergency braking are standard. Amid talks of stalls and shutdowns at parent company Fiat Chrysler, Ram is using the expensive new truck to try to win people over from Chevrolet Silverado territory and protect against Ford’s increasing presence in SUVs. It will hit showrooms in the US this summer; pricing has yet to be announced. 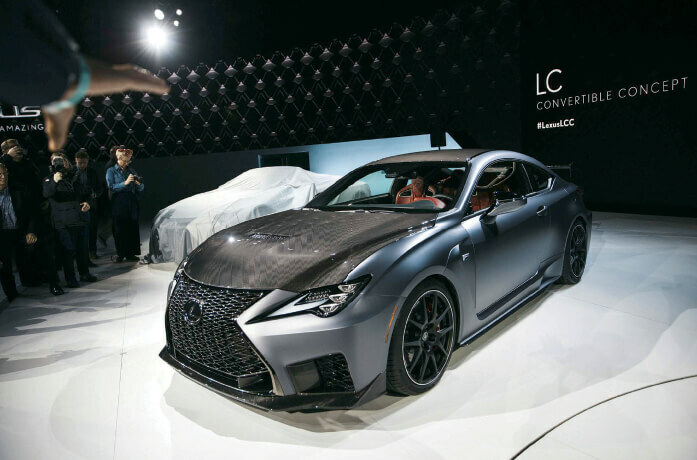 The 2020 RC F Track Edition will squeeze more power from its V8 engine than the 467hp by the current version of the RC F, likely making it the most powerful Lexus available (excepting the brand’s LFA halo car). It is 176 pounds lighter than the predecessor, thanks to massive amounts of carbon fibre used in the body kit, and it has 19-inch forged alloy wheels. Quantities are limited, though Lexus has yet to say how many it will make. 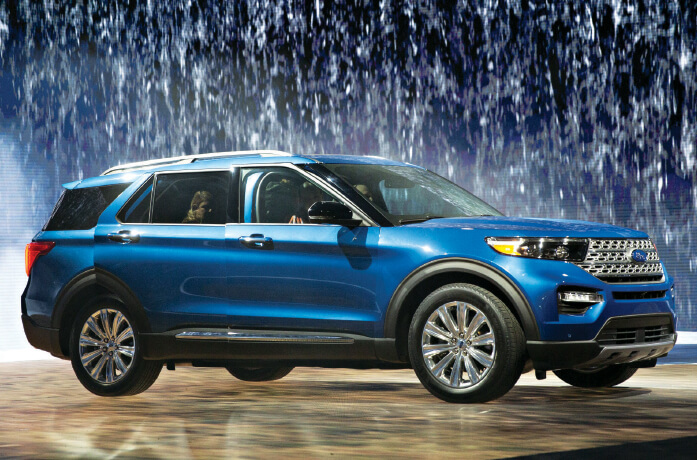 The 2020 Ford Explorer is Ford’s way of consolidating power against Toyota, Honda, and Chevrolet as it drops manufacturing sedans and ramps up on truck- and SUV-related efforts. The model line’s first redo in 10 years offers modern technology such as 4G connectivity, Wi-Fi, and a 14-speaker 900-watt sound system. Under the hood, it has a new 10-speed transmission paired with seven driving modes and three optional powertrains, including the hybrid version seen here. The new design will cost US$400 (RM1,656) more than the outgoing model, starting around US$34,000, when it hits dealerships this summer. 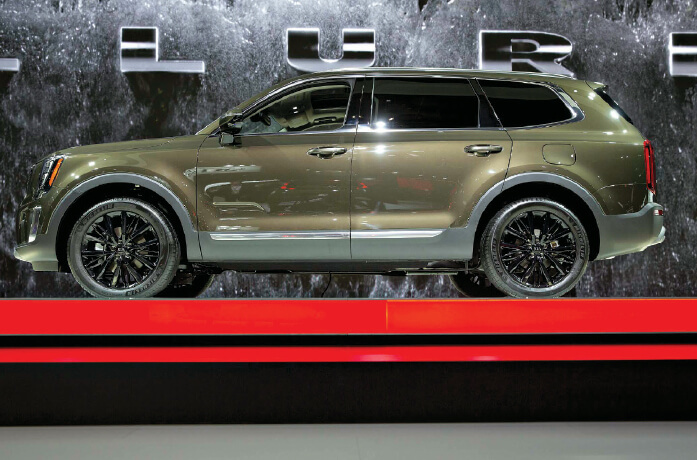 The 2020 Kia Telluride is the seventh in Kia’s line-up as it joins the rush of automakers trying to offer more sport utility models to entice buyers who have lost interest in traditional sedans. It comes with up to eight seats available and a 3.8-litre V6 engine, making it bigger than the Kia Sorento, which also has three rows. All-wheel drive and self-leveling suspension are optional. Sales will start in May. The Nissan IMs electric concept was one of the few sport sedans on display this year in Detroit. Like the Infiniti QX, it is only a design study, so it is very far from ever heading to production. Still, it gives an idea of where Nissan may take its electric sedan business in the near future. It includes such things as built-in augmented reality in the windshield, two layers of screen controls in the cockpit, and a “premier” seat in the middle of the rear, with an ottoman to boot. It is flanked by a pair of side seats that can be folded up when not in use. The Cadillac XT6 will be a second model in the Cadillac line-up to have a third row of seats. It is smaller than an Expedition but larger than all the other Cadillac SUVs and comes with ample luxury accoutrements, including fine-grain woods inside, captain’s chairs, premium leathers and an air ioniser. Cadillac will use it to lure luxury buyers from choosing Audis, BMWs and Mercedes-Benzes — before it makes an all-electric SUV priced to undercut the Tesla Model X, that is. Sales start in spring 2019. 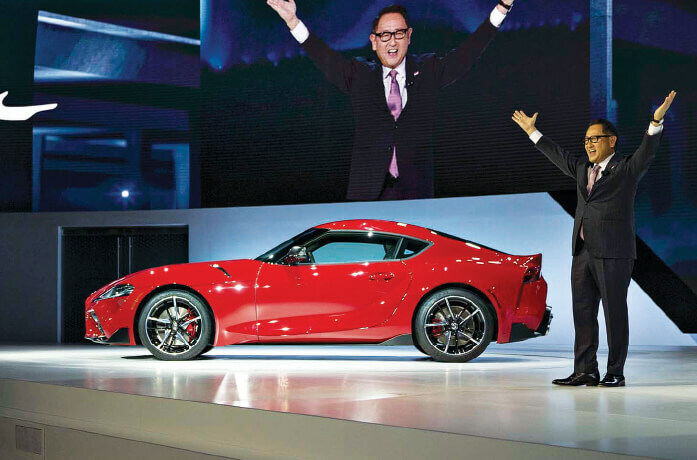 Akio Toyoda, president of Toyota Motor Corp, spoke during the debut of the 2020 Toyota Supra — which still managed to be the most exciting unveiling of the show, despite multiple leaks on blogs and social media. The continuation car of the Supra that held car fans’ imaginations in the 1980s and 1990s is built with many components borrowed from BMW’s tiny Z4. The modern two-door coupe is the first the company has sold in the US in 21 years. Prices start at US$50,000.